The urban environment can offer very favorable opportunities to generate power using wind turbines. Urban wind turbines represent a very effective, efficient, and artistic way to generate electricity. They can generate electricity from winds at low speed, and winds that are multidirectional. Wind turbines take advantage of unique wind patterns in the urban landscape. These images show how buildings interact with wind, and how streets behave as canyons and channels for accelerating and slowing down the winds. 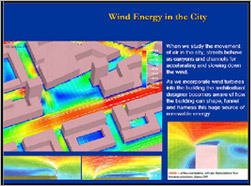 Each structure and urban area interacts differently with the wind, requiring specific analysis and offering unique opportunities to utilize this renewable energy source.